I have posted on this before. If you understand the whole process of transfer, and that, with more heat input, you have more transfer ability (assuming the possibility for differential is still there), and thus bigger circulation driven events precisely because there is more there, in either the atmosphere, or the oceans, to cause greater volumes of circulation. Thus we get bigger rain, or drought events, bigger wind, or no wind events, or bigger temperature variation events. As this happens, for instance, you get situations like we have been having in the Pacific Northwest the last week or two where, even though it's almost March, we have had fairly large amounts of snow on the ground; which is, of course, quite unusual for us. And this does all make sense when you realize that, with more, and bigger, translations of differentials (because, remember, it's all about evaporation and condensation, convection, pressure change, absorption, and radiation etc) , what you are, in effect doing, is taking bigger bites of cold out of our heat sinks at the poles, in order to keep these big translation events going. And those bites, year after year, aren't being made back up with enough recreation ice to keep the cold store going. It is really that simple and why this realization hasn't woke up more folks all around the scientific, political, and popular worlds of interactive discourse is truly an amazement to me. Because, as I have said, alarm bells of the most prodigious kind should be going off now, grabbing everybody's attention. We must mobilize as a species and we must do it very quickly. And the only people who can lead this properly is us. Wake the Hell up. Out existence is at stake. [Post Note: This engineering project would be a tremendous achievement, as well as an excellent example of what China is capable of doing now technologically. You still have to ask the question, though, of why going faster, through much hotter air, is really the best allocation of critical capability, when you face a dying planet. It is also, however, why we need to partner with the Chinese, as well as with the Europeans; all of the Pacific Rim, of Africa, of the Middle East, and every other part not mentioned, to tackle the two biggest problems we face: Climate change, and world population. And to try and take on the bridge building we are going to need to take on to create these partnerships is going to demand a completely new operating dynamic for the world. An operating dynamic that would actually give cooperation, as opposed to lists of dangerous competitions that we are all involved in, a chance to thrive. 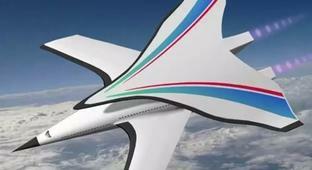 The double-wing plane just aced wind tunnel tests at speeds of nearly 5,600 miles per hour.